Steel helmet dating from the Second World War. It has been painted white and stencilled with FG in black – standing for Fire Guard. The steel helmet contains a padded liner and canvas chinstrap. The fire watchers scheme was compulsory and individuals could be called up for duty. The role of the Fire Guard was to take turns to watch for the fall of fire bombs throughout the night. 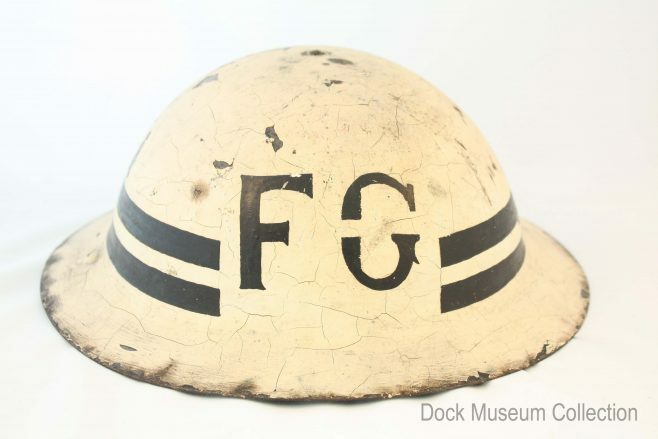 This helmet is likely to date after August 1941, as this is when Fire Guards received their official title. This helmet was found on Walney south end dump in around 1989.